Charlie Evans --------------------- Robert Walker Jr.
As Charles Evans, the lone survivor of a crashed colonizing expedition to the planet Thasus, comes aboard the U.S.S. Enterprise from the S.S. Antares, but when Captain Ramart of the Antares contacts Kirk about Charlie, the S. S. Antares is suddenly destroyed. Charlie shows not only a lack of grief for the people who had become his benefactors, but almost an indifference to their deaths. He seems only concerned that his new "family" like and accept him. Unfortunately, teenage hormones and an isolated upbringing make that difficult. Strange events occur whenever Charlie is angered — he makes Yeoman Rand disappear when she rebuffs his advances, he breaks Spock's legs when the Vulcan tries to discipline him, and he causes injury and discomfort to anyone who he thinks is laughing at him. Charlie demands that the U.S.S. Enterprise take him to the nearest inhabited planet, but Kirk fears that his uncontrolled temper and dangerous powers will create havoc for any civilization. Charlie gains control of the ship, but Kirk shortly overcomes him. Suddenly, an alien face appears on the bridge. It is that of a Thasian, the race who raised Charlie and gave him his extremely powerful psionic powers. 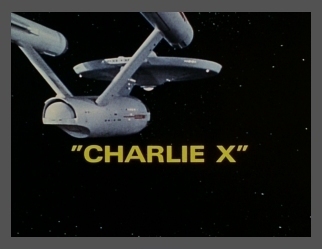 The Thasians had realized that Charlie has left their planet and thus sent their own starship to intercept the Enterprise. Despite Charlie's tearful pleas to remain, the Thasians take the lonely child back to Thasus. Before they depart, the beings restore the U.S.S. Enterprise and her crew to normal. Do you recognize the voice of the chef? It's none other than Gene Roddenberry himself! Kirk is definitely a man of action!